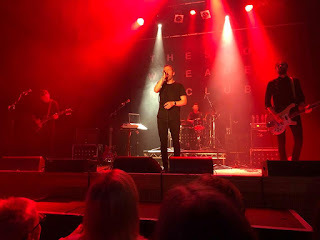 The Slow Readers Club played their biggest headline date outside of their native Manchester at Islington Assembly Hall in London on Friday night. 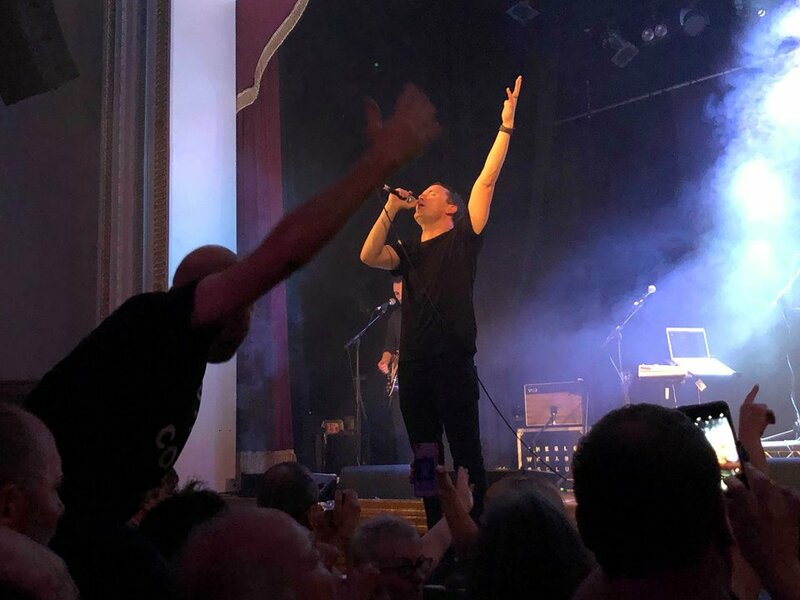 A celebration of the recent top 20 success of their third album Build A Tower, they blew away a crowd of devotees and those who've only recently discovered the band with a ninety-minute non-stop stomp through songs from all of their three albums. Support came from an energetic performance from October Drift. October Drift were made for big stages like this. There’s so much visual drama in their performance that they need the space to fully appreciate the scale of it. 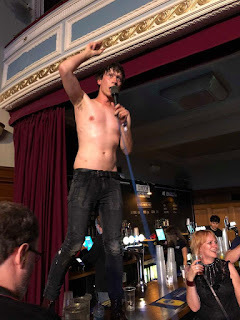 It’s not just the way Kiran takes off the stage mid-set, shirtless, and jumps into the crowd and makes his way to the bar at the back and finishes the song stood looking down surveying the audience who at first are startled, but then start to feed off the buzz that October Drift create. You can sense the belief that their recent tours with Editors has given them in the power of their live set. Recent single All Broken Down is one of the primary beneficiaries of this, sounding every bit the anthem to fill this hall, whilst the likes of Cherry Red, Losing My Touch and their final song The Past state their claim to be playing headline gigs of this size in the not too distant future. Biz and Dan never stand still, yet still manage to coax the lift and roar out of these songs as they build. It’s mightily impressive stuff from a band, who, like The Slow Readers Club, have served their apprenticeship and are ready to make the step up. That The Slow Readers Club have made that step up is indisputable. While they might not have sold out this imposing venue after sell outs at the Borderline and then The Garage last year, downstairs is packed out despite their chart success peculiarly not yet having been matched by the type of daytime radio play that will enable the next one. The atmosphere’s electric as they take the stage to the strains of Donna Summer’s I Feel Love and the “READERS” chants echo around this beautiful building, that the precise sound and stunning lighting show help accentuate the beauty of. Right from the start of Lunatic, the front rows are one heaving mass, people get on others shoulders in a way you only really see at shows where the audience are still in their teenage years and are lighter of frame, but there’s something that The Slow Readers Club bring out of people through their music that makes them want to relive the excitement of discovering your favourite band all over again. Songs are sung back at Aaron with an almost religious fervour, like some form of ritualistic chant with lyrics that examine the meaning of life, love and the human condition in a way that connects with the whole heart. It doesn’t matter whether the songs are their newest – they start with the album’s first single Lunatic, dispatch You Opened Up My Heart, once Aaron clears up some setlist confusion, in the middle of the set when others would hold it back to the end and conclude with the Cavalcade duo I Saw A Ghost and Forever In Your Debt that laid the groundwork for what’s happening now – the audience know everything and many lose themselves in the sort of moshing that takes them back to their youth. Not that The Slow Readers Club are nostalgic in any way, they take influences from their record collections and make something of their own that’s very much of the here and now. On The TV is a prime example. It talks to the mess the world currently finds itself in and distils it down to the magical line “on the TV, the world is on fire, we’ve all insane and I’m riding on a wave of sorrow” that somehow perfectly captures the essence of where the planet finds itself in post Brexit Trump times. The audience take the song’s riff and sing it back to the band, during the song it threatens to drown Aaron out as he sings the next verse, but at the end it’s so undeniably powerful that the band come back in instrumentally and finish it off again. 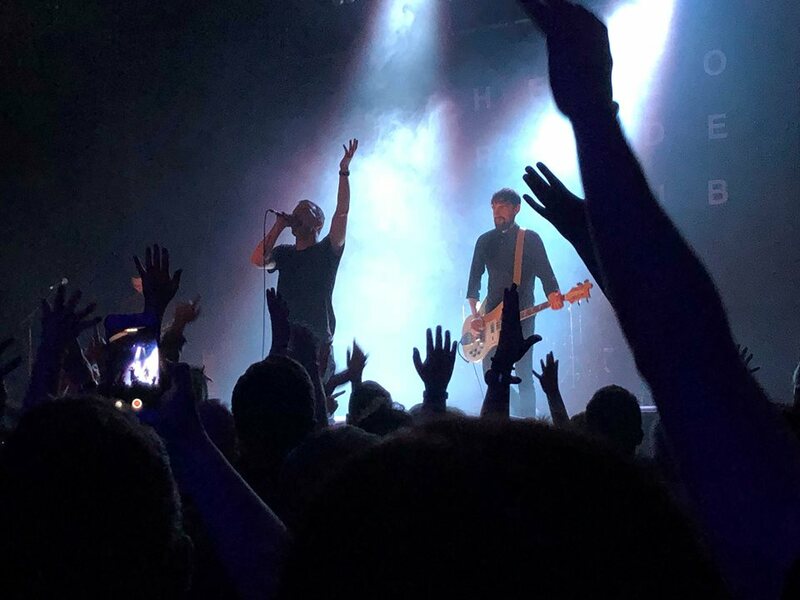 There’s such a self-assurance about the band these days and the sense that they’re now fulfilling their destiny, despite the fact all of them had to work on the morning of the gig back in Manchester and dash off at the end to catch the last train back. Hence there’s no encore per se, but Distant Memory, Build A Tower’s closing (and best) track, concludes what would have been the main set in a swirling tornado of sound as the band and then the audience let go and lose themselves. The setlist has been chosen to focus on the more upbeat songs in the Readers’ repertoire, so the pace they set is a furious one with little respite. David behind the drums is the conductor, dictating the pace of the songs, changing their direction, followed by Kurt’s effortless looking guitar riffs and Jim’s marching regimented bass. All of this gives Aaron the space and the canvas with which to work. His voice has got even more impressive and impassioned as the tour has gone on, the self-belief that the reaction gives fuelling even stronger and more imposing performances. If anyone ever doubted that The Slow Readers Club belong on stages like Manchester Cathedral, Nottingham Rock City and this one, they’ve now put those to bed. The Slow Readers Club played Lunatic, Supernatural, Start Again, Not Afraid Of The Dark, Fool For Your Philosophy, Lives Never Known, You Opened Up My Heart, Never Said I Was The Only One, On The TV, Sirens, Feet On Fire, Block Out The Sun, Plant The Seed, Distant Memory, Cavalcade, I Saw A Ghost and Forever In Your Debt. The Build A Tower tour calls at the following venues : Stoke Sugarmill (26) and Kendal Calling (July 26-29).